With a strong track record of satisfied customers, Just Termites is the ideal team equipped with the expertise to identify and solve your termite concerns. We have many years of local knowledge within inner Melbourne and regional Victoria and bring peace of mind to even the most complex situations. Our inspections meet 100% Australian Standards. We are fully accredited, licensed by law and join forces with the Australian Environmental Pest Association. Our treatments meet the Australian Health Department regulatory standards. Our termite inspections cover domestic, commercial and industrial buildings. We are experts in termite behaviour and identify the types of environments that are a risk to your property. We identify termite activity and report the degree of risk or causal damage. We customise effective solutions to meet your needs and budget. Termite treatment and management solutions are complex tasks. We listen carefully to your concerns and undertake a thorough inspection of both internal and external building structures. This includes subfloor (if accessible), roof void, garden landscaping and surrounding fences. We identify environmental trouble areas and make sure to uncover and address all concerns. 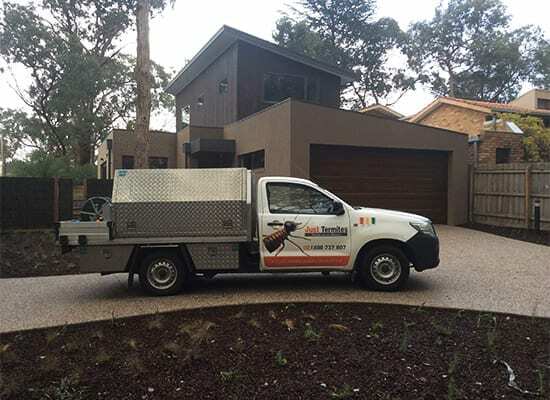 Our expert Termite Inspections comply with Australian Standard 3660. When it comes to protecting your home we undertake our responsibility with the utmost care. We take the time to educate our clients on environmental risk factors and effective solutions to deter termite invasion. Due to our in depth knowledge of termite behaviour we are able to uncover where termites have been or are residing in your property. As registered Timber Pest Inspectors we can assess the damage and provide a solution for rectifying the problem. Sometimes chemical treatment can be an important factor for eradicating termites and establishing a barrier. We are registered administrators for safe and environmentally friendly solutions. We understand that termite damage can be expensive. We work carefully with you to resolve the matter in the most cost effective way possible. Whilst we do not take short cuts that leave you at risk, we can custom tailor a solution so you can achieve peace of mind. Termites management solutions require follow up inspections to ensure the success of our eradication program. We also implement added safeguard measures to ensure the longevity of our protection plan. We have a 100% customer satisfaction rate.